Kids’ ‘Ultragirl’ ballet flats from Mini Melissa. Crafted from ultra-soft Melflex plastic in a matte finish, the shoes comprise a simple, slip-on design with a rounded peep toe and padded footbed. 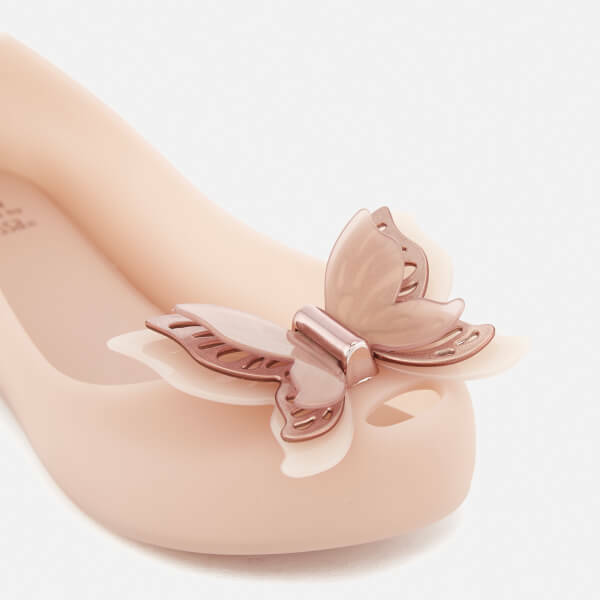 The shoes boast a flexible sole with a subtle micro heel, and are complete with a Melissa logo pin to the heel and an intricate butterfly adorned to the toe in a layered, rose gold tone design.